VIZ Media celebrates Halloween ComicFest 2017 with some all-ages fun by offering a FREE manga sampler featuring a sneak preview of POKÉMON OMEGA RUBY • ALPHA SAPPHIRE. Held annually, Halloween ComicFest will be celebrated this year on Saturday, October 28th at scores of comic shops and retailers nationwide. On this day, participating shops offer fans and visitors FREE Halloween ComicFest samplers filled with previews of exciting upcoming titles. For additional information and a list of participating retailers, please visit: HalloweenComicFest.com. 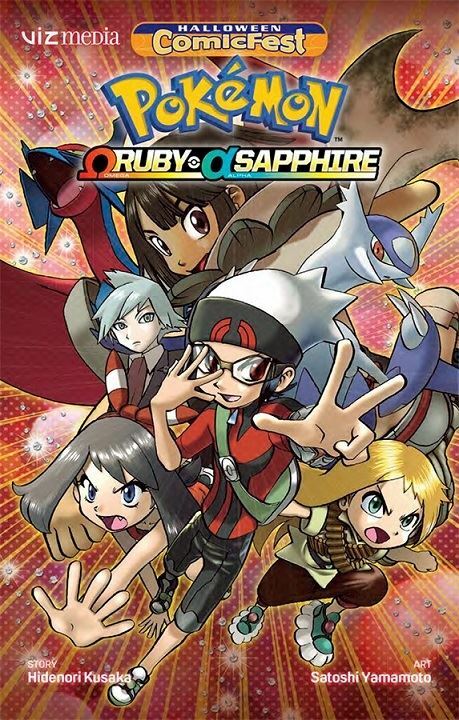 Ruby, Sapphire and Emerald face a new crisis of epic proportions in the latest POKÉMON manga adventure: a giant meteor hurtling toward the planet! Years have passed, and now Sapphire and Emerald are training in the new techniques of Mega Evolution. And they’ll need Ruby’s help! Searching for a way to change the meteor’s course, Ruby journeys to the Sky Pillar to earn the trust of Zinnia, the Lorekeeper of the mysterious Draconid tribe. Does she have the key to saving the world? And what does all this have to do with Legendary Pokémon Rayquaza?